We all have those awkward corners and spaces in our home, those areas that cry out for a touch of decor and style. It can be challenging to know just what to tuck into these spaces – I know I have a couple that have challenged me! For one of those corners I have a distressed ‘sap’ bucket that I use for faux stems that I update for each season and celebration. 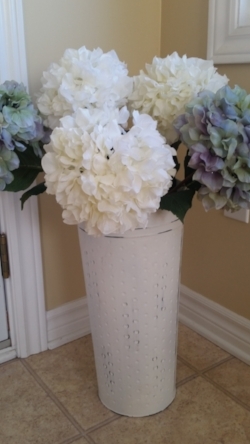 I have used creamy white and blue/gray hydrangeas as the base element – I never remove them. The other stems are changed out according to the season or celebration and are in colours that coordinate beautifully with the white and blue/gray colour scheme. For the fall I clear out the more summery items (sea grass and eucalyptus), leaving the hydrangeas. Next I tuck in silk oak leaves with acorns and creamy white silk Chinese lanterns. These are followed by straw pumpkins for an added touch of harvest and Halloween. This is where the rule of odds comes in. Yes, it seems counter intuitive but odd numbers of items bring more balance to your decor look and provide a more full display. A beautiful and visually pleasing vignette has items that are relative to one another in scale. While you want items of varying scale, do not make them too large or too small compared to one another. To avoid this, use a range of sizes scaled from smaller to larger so the difference is not so striking. When working with a display of botanicals the overall height of the stems should not be more than 2/3 higher than the container they are in. If the stems are too short or too high the overall look is out of proportion and off balance. My approach is to balance texture within my display. If the container I am using for a display of botanicals has a lot of texture, I tend to take a monochromatic approach and use botanicals that are all the same colour. And if the container is very plain and simple, I use botanicals with lots of visual texture in a variety of colours – typically an odd number of botanical types (in this case hydrangeas, oak leaves and pumpkins) and colours (in this instance creamy white, blue/gray and jute). The most important part of creating or styling decor is to have FUN! Style, re-style, experiment, play with the display, try it out in various locations. It costs nothing to keep moving things around until you have a look you love and is stunning tucked into the chosen space. And be sure to share pics - I love seeing the results of your work!